NEW YORK - As Kevin Garnett and Paul Pierce were about to take a picture with Italian soccer star Alessandro Del Piero recently in Rome, Garnett noticed the third member of the Celtics' star trio was missing. So Garnett called for Ray Allen by his nickname. "Jesus. Jesus come here," Garnett said. Allen has been stuck with the nickname Jesus since he played the role of prep basketball star Jesus Shuttlesworth in the movie "He Got Game," a 1998 drama-sports film directed by Spike Lee and starring Denzel Washington. Even though Allen is a six-time NBA All-Star, many fans call him Jesus instead of Ray. Tonight, Jesus, er, Allen, and Lee, a renowned courtside Knicks fan, could be reunited when the Celtics play the Knicks in an exhibition game at Madison Square Garden. "We don't call him [Jesus] every day," said Pierce, who has acted in several commercials. "It's something that just comes up. We'll quote the movie when he does something special. He's not a bad actor. I give him three stars out of five." Said Lee: "That's my man. Jesus Shuttlesworth." Allen was in the movie "Harvard Man," playing the role of Marcus Blake, and played himself in a 2001 episode of "MADtv," in rapper Mos Def's video for "Umi Says," and in Air Jordan commercials. Even so, none of those appearances has been as memorable as his role as the Shuttlesworth character in "He Got Game." Allen says being called Jesus "every day" can be annoying, but he realizes it probably won't stop until he gets another high-profile acting role. "At first I was usually combative," Allen said. "You hate people calling you that. I know a lot of people in the TV and movie industry, and if you have a role that sustains a decade, people call you by that name and you just have to deal with it. It's who you are. That's what people relate to me as until I do something else of stature. "With Denzel, they don't call Denzel by any character of any movie he's been in because each one gets even greater. He goes from shooting 'Training Day' to now 'American Gangster' to 'Crimson Tide.' Nobody remembers his character's name because it's Denzel on the screen." Lee recalls asking NBA players, whom he declined to name, to try out for the Jesus Shuttlesworth role. He said Allen was one of the few who had the guts to do it, and added he had "natural talent" and "respected the craft of acting." "We looked at all the rosters in the league and said, 'Who looks like they could still be in their senior year in high school?' " Lee said. "And a lot of these guys didn't want to audition. They wanted me to hand them the part. I said, 'Hell no.' Ray auditioned and he worked. He was working eight weeks before we even started the shoot. He was great." Allen said he prepared very little for his tryout and was nervous. "[Lee] had a couple actors and actresses that read with me, so that was pretty nerve-racking," Allen said. "I thought I was doing it just to be doing it because, 'Hey, I'm in the NBA. I have a chance to be in a movie.' And then there was a point where I realized it was going to be a little bit more [than I thought] and I started focusing on it a little bit more. When you do this, you have to have the ability to focus." Allen also didn't forget that his bread and butter comes from playing in the NBA. He turned down an opportunity to audition for a part in "Saw II" two years ago in New York because he was in the playoffs with the Sonics. He's turned down opportunities to be in rap videos and commercials, although he recently filmed two commercials with Garnett and Pierce for ESPN's "This is SportsCenter" series. And when he was playing for the Bucks, he was asked to join R&B singer Brandy in her video "The Boy Is Mine." Allen quickly turned the opportunity down after he was asked to go to Los Angeles and miss several games to film the video for free. "It's hard right now," said Allen, 32, whose Celtics had yesterday off in New York. "As I've gotten older, I've dedicated so much more of my time to taking care of my body, staying in shape. 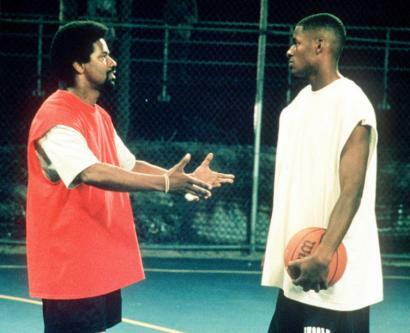 When I did ['He Got Game'], I worked out, but I was on the set 14 hours a day." Said Lee: "If he wants to, especially after he hangs it up, he definitely can do some good work." Lee says he and Allen are "great friends" now, but he isn't happy to see his friend playing for the Knicks' Atlantic Division rival. "It's killing me to see him in that green and white," Lee said. "If Jermaine O'Neal ends up on the Celtics, that's definitely [in need of] an NBA investigation."